Fabiyi on duty for Gombe United when the going was good. Wrongly accused and attacked by fans of his former team Gombe United, after conceding three goals in a match that ended 3-3, Emmanuel Fabiyi, is pleased the League Management Company (LMC) has offered him a lifeline as he prepares to continue the season at Sunshine Stars. Ironically, the Benin International goalkeeper was “sentenced and jailed” by officials of his club, who were supposed to defend him. Gombe never bothered about his health, but were quick to declare him AWOL. Fabiyi relocated to Jos after the attack as his life was in danger and accused club assistant team manager, Alhaji Kwairanga, of inciting fans against him on SuperSport NPFL Highlight Program, Naija Made. In an official statement signed by Gombe spokesman, Tanimu Umar, the club disclosed that a special committee of investigation made up of members of the management board, police and SSS has been set up to investigate the allegations against the Benin Republic goalkeeper. Thankfully, the “Kangaroo Court” convened by the club set him free. On the eve of their road trip at Plateau United, officials of the club pleaded apologized and pleaded with him to return “home” as the duo of Joseph Onwuga and Ahmed Yusuf has been conceding goals. Perhaps to confirm their woes, Plateau hammered Gombe United 5-1 to record the worst outing by any team this term. Fabiyi initially expressed concern that the match fixing allegations will tarnish his international profile. “I received from many people across the world. In fact, calls also came from Benin Republic,” he told naijaleaguez.com.ng. Despite the apologies from Gombe United, he informed officials of the club to address a press conference to correct the damage done to his personality. 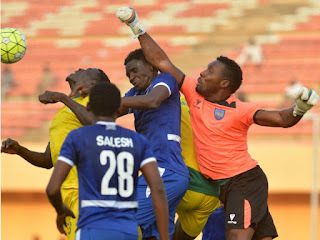 The intervention of the League Management Company, organisers of the NPFL have led to a psychological and emotional recovery for the goalkeeper. “Thanks to the LMC, this drama has come to an end. Special thanks must go to Chairman, Shehu Dikko, for his role. With a special clearance from the LMC, Fabiyi will play at Sunshine Stars till the end of the season. “As a professional footballer, I have been training since relocating to Jos. I can’t wait to resume at Sunshine Stars,” he stated. Interestingly, Fabiyi’s wife plays for the women’s team of Sunshine Stars, the Sunshine Queens. Fabiyi equally believes his management team, MatchRoom Sports and Media, has played a significant role since the drama unfolded. “MatchRoom has done well for me and I appreciate their role. I recommend players to get an efficient PR team like MatchRoom,” he told naijaleaguez.com.ng.